The Walter Reed Fisher House — one of the beautiful designs typical of Fisher Houses throughout the country. Above: The Walter Reed Fisher House — one of the beautiful designs typical of Fisher Houses throughout the country. Michigan will gain two Fisher Houses to aid families of vets at VA hospitals. 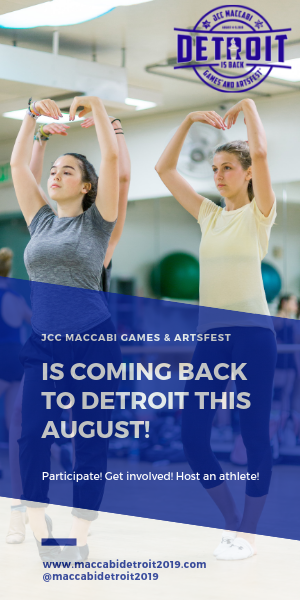 An important addition to Detroit’s burgeoning urban landscape will have an indelible impact on Michigan veterans and their families and a proud Jewish component at its core. With approval officially secured by the U. S. Department of Veterans Affairs and the Maryland-based Fisher House Foundation (FHF), fundraising efforts can now begin to bring a Zachary and Elizabeth M. Fisher House to Detroit. To be located within walking distance of the John D. Dingell VA Medical Center, Fisher House Detroit will provide, at no charge, a comfortable and secure “home away from home” residence for family members who must travel outside a normal daily commute to visit loved ones being treated at the hospital. 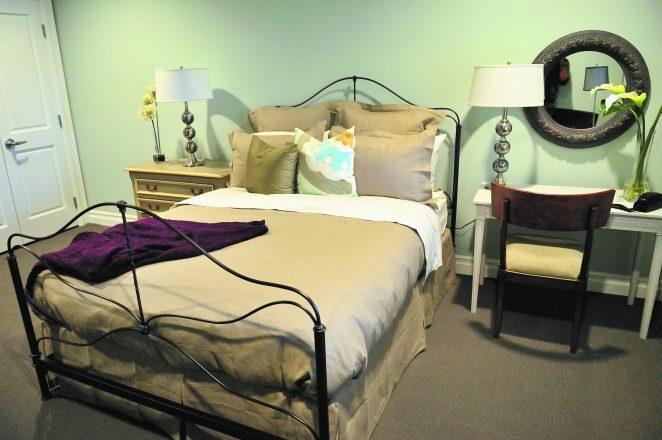 A typical bedroom in a Fisher House suite; this one is in Greater Los Angeles. Fisher House was the brainchild of prominent Jewish New York real estate mogul and philanthropist Zachary Fisher of blessed memory. After a leg injury prohibited him from active duty during WWII, Fisher began what would be a lifetime dedicated to the well-being of our men and women in uniform. The announcement of the Detroit location now means that two of Michigan’s five VA medical centers will be the beneficiaries of Fisher Houses. Plans for Michigan’s first Fisher House at the VA Ann Arbor Healthcare System were unveiled in 2016 with ground-breaking expected next year. The Detroit and Ann Arbor locations are welcome news to the 650,000 veterans in Michigan. Both houses will be overseen by the umbrella organization Fisher House Michigan and will bring to almost 80 the total number of Fisher Houses located at military and VA medical centers across the nation. Fisher House is also making an impact internationally with homes now open in Great Britain and Germany. Fisher Houses have up to 21 suites that include private bedrooms and baths. The families in residence share a common kitchen, laundry facilities, a dining room and a living room. The Detroit Fisher House is projected to provide 16 suites. Since the doors of the first two Fisher Houses opened in 1991, more than 335,000 families have benefited from more than 8 million days of free lodging, representing a savings of an estimated $407 million in out-of-pocket costs for the military, patients and their families. CharityWatch, an independent philanthropic watch dog, names Fisher House as one of only three military charities with an A+ rating. Most recently, Fisher House Michigan (FHM) was awarded the GuideStar Platinum Seal of Transparency. For his decades-long commitment to U.S. armed forces and the community at large, founder Zachary Fisher has been recognized by five U.S. presidents, the chairman of the Joint Chiefs of Staff, secretary of defense, former British Prime Minister Margaret Thatcher and the late Israeli Prime Minister Yitzak Rabin. In 1998, President Clinton awarded Fisher our nation’s highest civilian honor, the Presidential Medal of Freedom and, a year later, conferred upon him the status of an honorary veteran in the U.S. Armed Services. This latter recognition has previously been awarded to only one man — Bob Hope. The Fisher House Foundation generously underwrites the construction and furnishing of each home. Each facility is then gifted to the Department of Veterans Affairs, which oversees its operations, supported in part by endowments reliant on donations from the public and organizations. One group that is helping lead fundraising efforts to make the Fisher Houses a reality in Detroit is Motor City Veteran’s Village (MCVV), a nonprofit charity that, according to its president, retired Jewish War Veteran Brig. Gen. Donald Schenk, “is focused on improving access, quality of life and education for veterans and their families in Southeast Michigan. “After 30-plus years protecting America’s freedom, and another almost decade and a half protecting those who protect our freedom, it seemed natural to do what I could for those who have come before and since by protecting and supporting the rights and benefits of veterans and their families,” Schenk says. Motor City Veteran’s Village’s ties to Fisher House Michigan will go a long way to filling a critical void in the existing Veterans Affairs Medical Center locally because “a family’s love is good medicine,” according to the Fisher House Foundation. 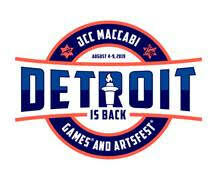 Detroit’s local Jewish community has already had a profound impact on our state’s Fisher House plans. 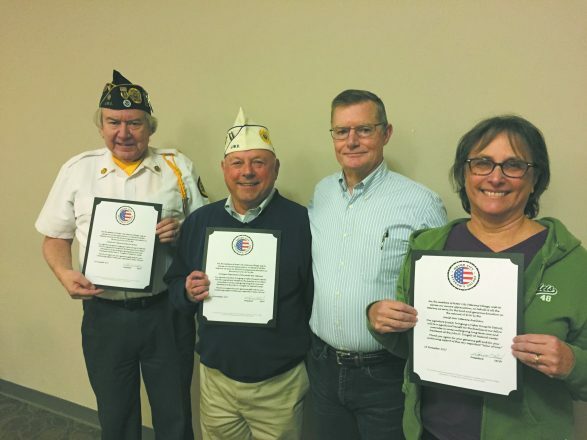 Jewish War Veteran members Marc Manson, JWV Memorial Home; Larry Berry, Commander, JWV Department of Michigan; and Linda Zyla, JWV Lt. Raymond Zussman Auxiliary #333, hold letters of appreciation from Motor City Veteran’s Village signed by its president and JWV member Ret. Brig. Gen. Donald Schenk (in striped shirt). 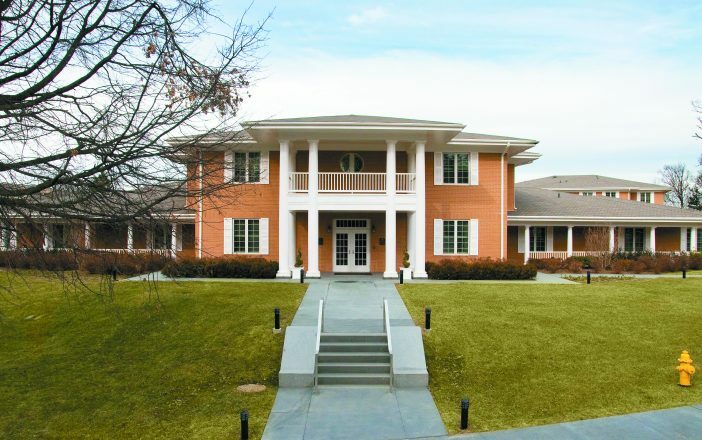 In 2016, Detroit philanthropists Mandell “Bill” Berman, a WWII Navy veteran, and his wife, Madeleine, both of blessed memory, were the first to contribute to the future Fisher House development through the Mandell L. and Madeleine H. Berman Foundation. The foundation continues to make annual donations. Last year, the dedicated posts that comprise the Jewish War Veterans (JWV) Department of Michigan also made contributions to the MCVV’s Fisher House initiative. A fundraising drive in November was spearheaded by Army Sgt. Marty Levine, a Viet Nam-era veteran, who, like Schenk, is a member of JWV’s Zussman Post 135 and a MCVV board member. Schenk used the occasion of being a guest speaker at a JWV post meeting at Temple Shir Shalom last November to present members of the JWV and the Women’s Auxiliary certificates of appreciation for their efforts on behalf of Motor City Veteran’s Village. I attended that meeting and had the privilege of hearing Schenk share stories of his distinguished military career. However, it was only during a private conversation with him after his remarks that I learned that Donald Schenk was a convert to Judaism, a memorable journey, details of which are highlighted below. Ann Arbor attorney Harvey Berman’s affiliation with Fisher House began when he attended a program honoring veterans at University of Michigan’s Hill Auditorium in 2015, where he learned about plans to build the first Fisher House in Michigan. “The inspiring stories of the veterans were moving and brought tears to my eyes and many others in attendance,” he says. Soon after the 2015 Hill Auditorium event, Berman and his law firm, Bodman PLC, agreed to provide services pro bono to help create the nonprofit Build It for the Brave. It later became known as Fisher House Michigan when the project was officially approved for Ann Arbor. Berman’s early involvement led him to accepting a seat on FHM’s first board. To donate and learn more about Fisher House Michigan and the Motor City Veteran’s Village (MCVV), visit fisherhousemichigan.org and motorcityveteransvillage.org. To earmark a donation for the Detroit location, make your check payable to Motor City Veteran’s Village, 500 Temple St., Detroit, MI 48201. Add a note on the memo line designating the contribution for Fisher House Detroit. Don Schenk was born and raised in Baltimore, Md. He grew up in what he described as a “non-observant Protestant household” and, while in high school, had every intention of becoming a teacher. Today, at 68, he is a convert to Judaism and a retired, highly decorated Army brigadier general. His faith and career paths began evolving in high school. Schenk was enrolled in an intensive college preparatory curriculum at a Baltimore magnet school where, he said, “most of my peers were Jewish and those peers became my friends.” He completed his bachelor’s degree at Western Maryland College in Westminster, Md., with the help of an Army ROTC scholarship, and was commissioned a Second Lieutenant in Armor (tank corps) in 1971. He was later educated at several military schools and earned a master’s degree in management from Central Michigan University. He attributes his “real introduction to Judaism” to his wife, Janet (Greenspan), of 28 years and their decision to raise their children in a Jewish household. “Taking our boys to Congregation Shir Tikvah, participating in family and adult learning and worship in preparation for our sons’ bar mitzvahs, made me realize that conversion was the logical culmination of experiences first encountered in high school.” Today the couple are members of Congregation Shaarey Zedek in Southfield. Schenk has held assignments during peace and war, including direct combat operations in Iraq. 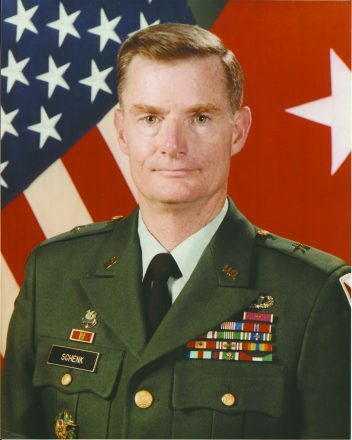 Before he retired in 2004 after 35 years of service, equally balanced between the operational Army and the procurement/program management business of the Army, he would be the recipient of numerous decorations including a Distinguished Service Medal, Legion of Merit and the Bronze Star, to name a few. As a life member of the Jewish War Veterans, he has become active in the Department of Michigan as well as 1st Lt. Raymond Zussman Post 135. He continues to work tirelessly on behalf of his fellow veterans and the Jewish community, including his work as president of the nonprofit Motor City Veteran’s Village.